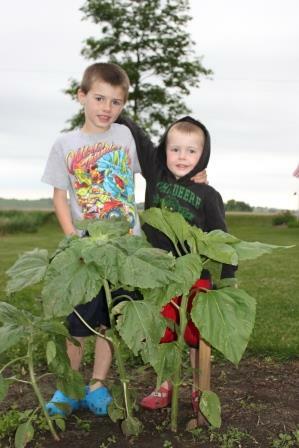 Keith and Sam thought this would be a great way to measure the growth of the sunflower. Last Friday, I saw many farmers posting on Facebook that they were still trying to finish their first planting. In addition, it means we have less available feed to feed farm animals in Minnesota. There is a serious shortage. It is important to remember that Friday was the first day of summer – the longest day of the year. So our opportunities for good growing days for crops are declining. They are not just getting shorter in day light but also closer to the days when the snow will fly. Follow this discussion and more on the Minnesota Farmers CARE Facebook page. So what does this mean to the consumer? This affects our CSA crops and when fresh produce will be available because we simply have not had the heat, and the growing degree days to produce the crops. Although this may affect the crops, it certainly does not slow the weeds down. This is not an excuse. Rather this is the simple science of food production and acceptance of what Mother Nature presents us that is simply out of our control. I believe this is a reason so many farmers have a strong faith in God. Sometimes, all you can do is pray. 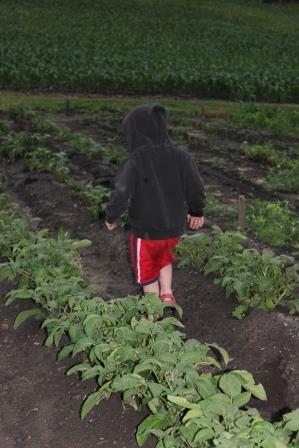 Sam is checking the crops after the rain as we had some strong winds. Everything seems to be standing back up. 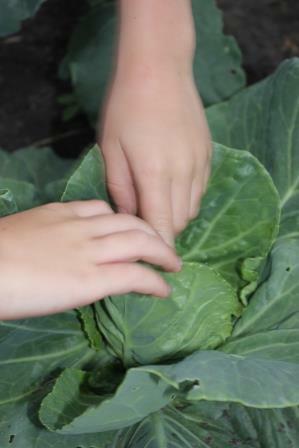 Keith is checking the growth of the cabbage and scouting for insects. The potatoes grew like crazy this past week. 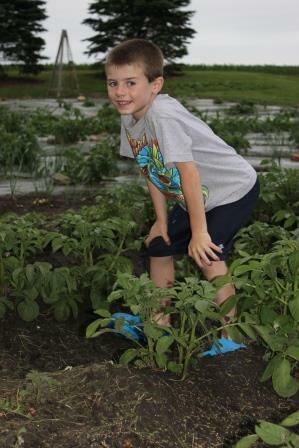 We hilled the potatoes as well so that they had more soil area to grow and produce more potatoes. Please read as this is updated about with specific information on each crop. Remember food safety in your kitchen when preparing, always wash your before eating. 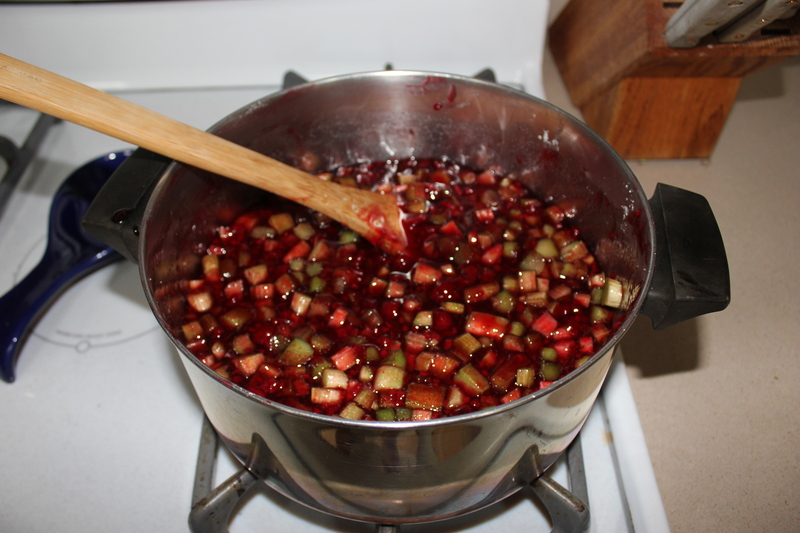 Rhubarb – This looks like a delicious rhubarb sauce recipe from a friend and North Dakota farm wife. Highly recommend giving this a try. Black Seeded Simpson Lettuce – One of my favorite garden crops. Some of the crops are ran under cold well water to take the field heat off of them so they last longer in your refrigerators. They are not washed – just cooled. Wash your vegetables before eating. Some fun facts about lettuce. If you are having trouble with getting your kids to try this…well one of my favorites as a child was a leaf of this sprinkled with sugar. LOVE IT!! Red Oak Leaf Lettuce – Some young leaves – remember to wash before eating. A combination of these vegetables will make such a wonderful meal! Beet/Beet Leaves – Many times I have seen in high-end restaurants beet leaves in my salads. Well here is your opportunity. These are young plants that we are thinning out of the rows. It will add color and nutrition to your salads. 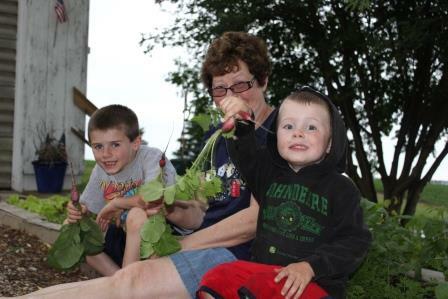 Keith and Sam were excited to show their Grandma Norma the radishes they were growing. After all, it is one of her garden favorites. She loves sliced radishes on buttered bread for a sandwich. Radishes – Cherry Belle, French Breakfast and purple radishes – yum!! Wash, cut off the tops and also the bottoms, slice and enjoy in salads. Herbs – chives, cilantro, golden oregano and thyme (bags are labeled with the first initial) wash then chop up chives into small pieces. The link shows you how to freeze your herbs in ice-cube trays. This will work great for when you want to make fresh salsa later in this summer. Fresh cut arrangement –A variety of hosta leaves should last you a few weeks in your house. Lovely greenery to brighten your day. Remember that pick-up and deliveries will be on the schedule you have arranged with Harner Brothers CSA with harvest on Wednesday evenings. It is your responsibility to know that the pick-up or drop-off time will occur at the agreed upon time, and it is your responsibility as a shareholder to know this and be responsible for the produce at that time. If you are unable to utilize your share that week, it is still your responsibility: find someone else to pick it up or donate it to the food shelf. Each box is labeled for each family. The same boxes will be used for your family throughout the season. Boxes and containers should be returned the following week. Bags will only be used once. Every day we go out to the garden to see what has grown and changed. We found a lot “growing” on. As we said our prayers tonight, both of the boys gave thanks for all of you, our CSA members. While this surprised me a bit, it also gave me great satisfaction. Satisfaction in the fact that the boys are learning some of the qualities that we want them to learn from the CSA. What qualities you may ask? 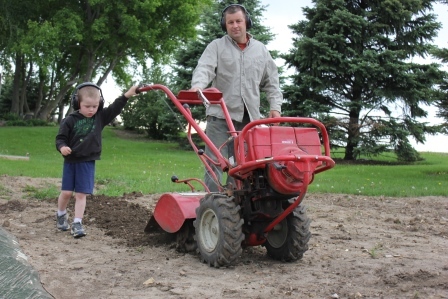 First, we want them to learn hard work, common sense, practical hands on knowledge and farm family togetherness. They need to understand how important our commitment is to growing quality food and upholding our commitments to all of your families. These, I believe are in-born qualities that we are simply allowing to grow and develop in our children. So thank you for helping us to do so. 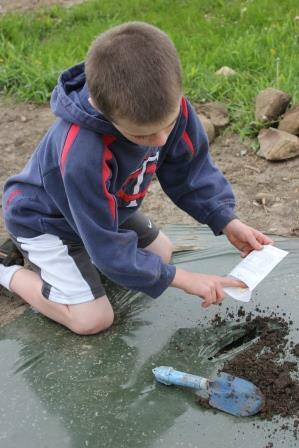 Second, it is our rule that when our member families come for the CSA pick-up, before they play, THEY MUST take their friends out in the garden and TEACH them something about what is growing, show them insects, teach them weed identification…something about what has happened out there this week. As part of the CSA, it is a priority that Keith and Sam learn how to effectively communicate and teach others about how their food is grown. Third, but certainly not last we want them to learn what it means to give to others. It is giving through growing food for your families, sharing additional produce with families in need and learning how to use the money they have earned…donating to worthy causes (they have selected the American Red Cross and Gillette’s Children’s Hospital), saving and/or learning responsible money management. On another note, the weather has been a “perfect storm” of sorts: a drought last year, minimal snow cover over the winter which provides a protective insulation to perennial crops and a wet spring. These conditions are making for challenging growing conditions. So your patience is appreciated. It doesn’t seem to matter when we planted, God is teaching us patience…that all will come in its own time. 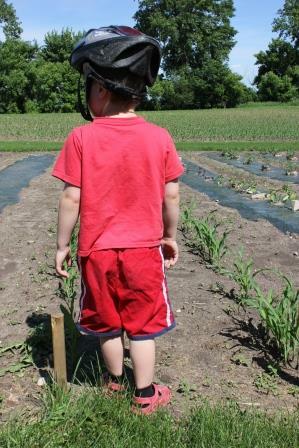 Sam wanted to take a look at a corn root. 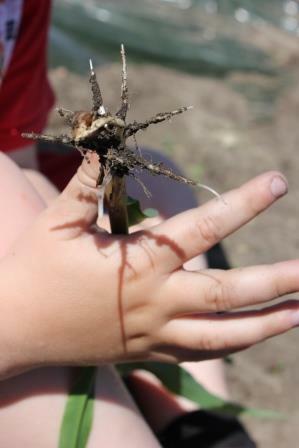 He was surprised to find the roots coming out of the seed that he had planted, but understood that is where the plant’s life begins. Learn more about corn development and what Sam is examining from Purdue University. 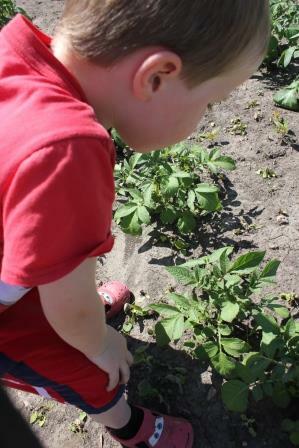 As Sam examined the potato’s he found some potato bugs. He was picking them off and squashing them. As he did this I heard him say, “Stop eating my potato plants you crazy bugs!” We have planted some marigolds and dill to help generate beneficial insects to eat the potato bugs this year. Rhubarb – I wanted to update you about the rhubarb. We anticipate this back in your box next week and for a few weeks following. We hope you appreciate the break this week. The several reasons why there is no rhubarb. 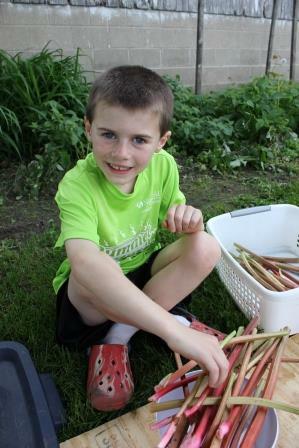 Some of you may know that in addition to the CSA the boys also sell the rhubarb for $3 per pound with $1 of every pound donated to Gillette’s Children’s Hospital and the American Red Cross. Both charities they selected. Well, this week we had a request for 40#. We knew that the patch needed a good harvest and in doing so would open the patch up for the opportunity for good regrowth if given cooperative growing conditions which means a longer growing season and better quality rhubarb and in the end more rhubarb for our CSA members. Some of you had asked how long will this crop last? Doesn’t it get bitter and/or not as tasty later on in the season? Well this should help the rhubarb to taste like it does earlier on in the season. So after much discussion, we all agreed that a good harvest would benefit a lot more people. Thank you for your understanding and look for it in the box for the next few weeks. Keith was excited to find three different types of radishes: French, Cherry Belle and Purple. 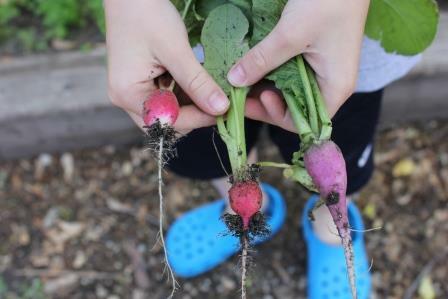 Radishes – Cherry Belle, French Breakfast and purple radishes – yum!! Wash, cut off the tops and also the bottoms, slice and enjoy in salads. Here are some additional ideas and information on this crop. Herbs – chives, cilantro, golden oregano and thyme (bags are labeled with the first initial) wash then chop up chives into small pieces. The link shows you how to freeze your herbs in ice-cube trays. I heard some of you were excited about the cilantro and using it in your tacos and taco salads. What a great idea that we will have to try! Fresh cut arrangement –Peonies, I hope they make your house smell fabulous. Truly one of my favorite flowers. Yesterday afternoon prior to harvest, I didn’t know what we would have left in the garden. Steve had called and said we had downpours, and he had driven through hail on his way home. I was relieved to find that it appeared that we were fortunate to have skirted the hail and that we had “captured” 2 inches of rain. I think it is rather difficult to really measure that type of downpour. The crop was still standing, and we were still able to have something to harvest. The cold, wet spring is another story. It is amazing to me how slow many of the “cold” season crops are to grow like the varieties of lettuces and spinach. We really need some heat to provide some growing degree units for the plants. I know that many of us are hopeful that it will come sooner than later. In the meantime, we continue to plant between storms so that when the heat comes we have a variety of produce for everyone. We also continue to check the crop and look for plant health, insects and weeds. It truly is amazing that even thought the spring is difficult for the plants we need to grow for food, it doesn’t seem to bother the insects nor the weeds. Remember food safety in your kitchen when preparing, always wash your before eating. 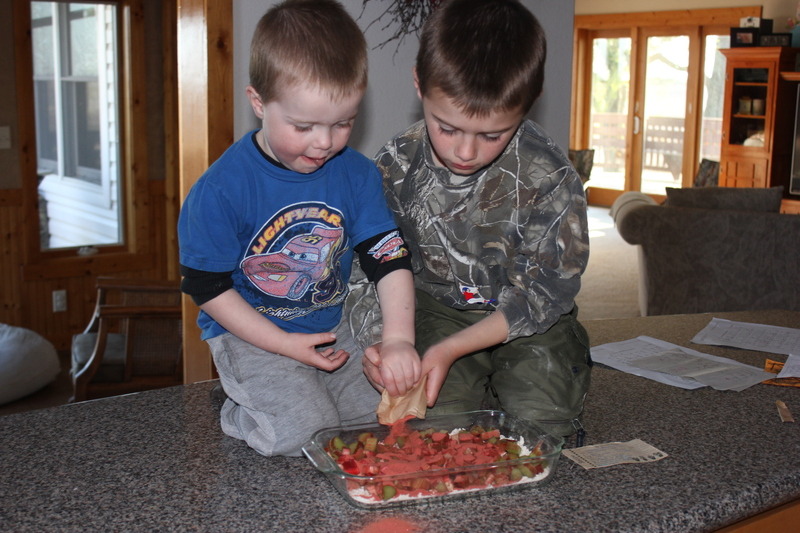 Both the boys help to harvest the rhubarb. Keith is preparing it to bag. Rhubarb – one pound equals about 3 cups. Wash, cut the ends off, cut off any bad parts damaged by wind or hail, chop into 1/4 – 1/2 inch pieces. You can freeze it in a Ziploc bag (no blanching) and use for months to come. Our family loves it in muffins, breads, jam, pie, crisp, sauce and torte. See the recipe of the week for a rhubarb torte recipe. Super easy and fast and great to do with the kids. Asparagus – wash and run a knife gently over the darker arrow pieces on the stem. Cut into 1 inch pieces and place in microwave for a few minutes. Follow your microwave directions. 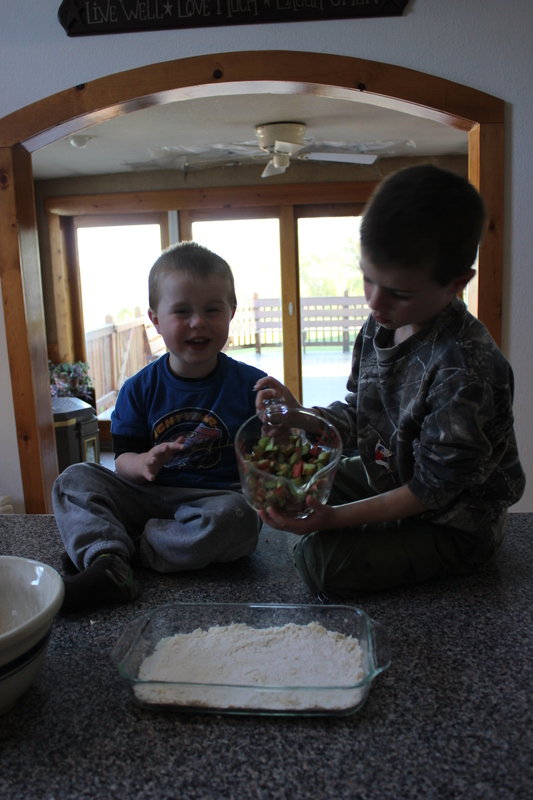 Sprinkle with some parmesan cheese – the boys absolutely love it this way! See how asparagus is harvested on America’s Heartland a PBS TV show about America’s farmers. Herbs – chives, lemon thyme, golden oregano and thyme (bags are labeled with the first initial) wash then chop up chives into small pieces. The link shows you how to freeze your herbs in ice-cube trays. Fresh cut arrangement – Irises and Hosta leaves…Remember with the Hosta leaves they can last several weeks in a vase of water. After the irises die, take the Hosta leaves out, give them a fresh-cut, and place in fresh water so that they will last longer. The greenery in the house is a day brightener. 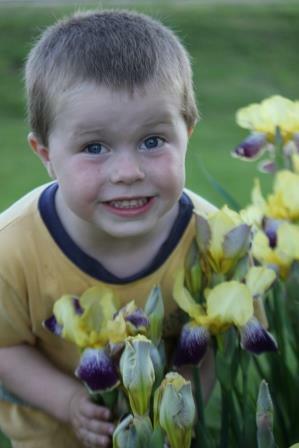 We had a few irises for your flowers this week. Next week, hopefully some peonies. 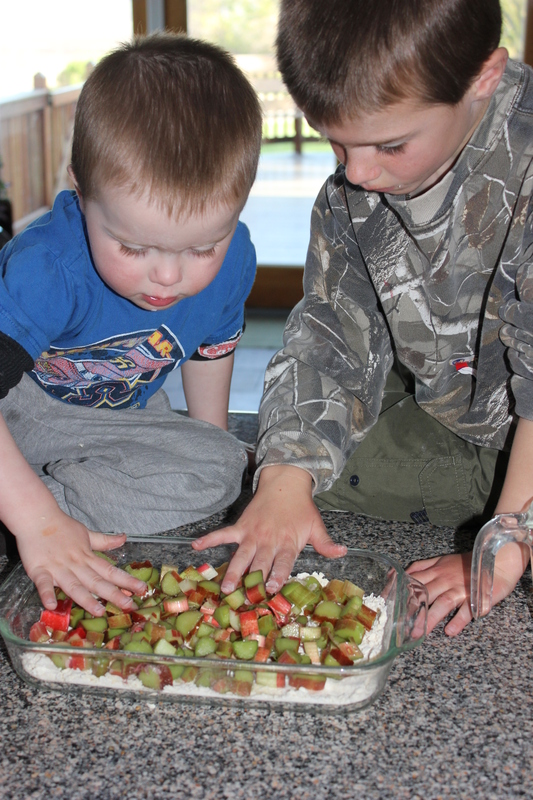 We love this recipe for rhubarb torte which is from one of the many fantastic dairy farm families I had the privilege to work with in Fond du Lac County, Wisconsin. Fast and easy to make with your kids. 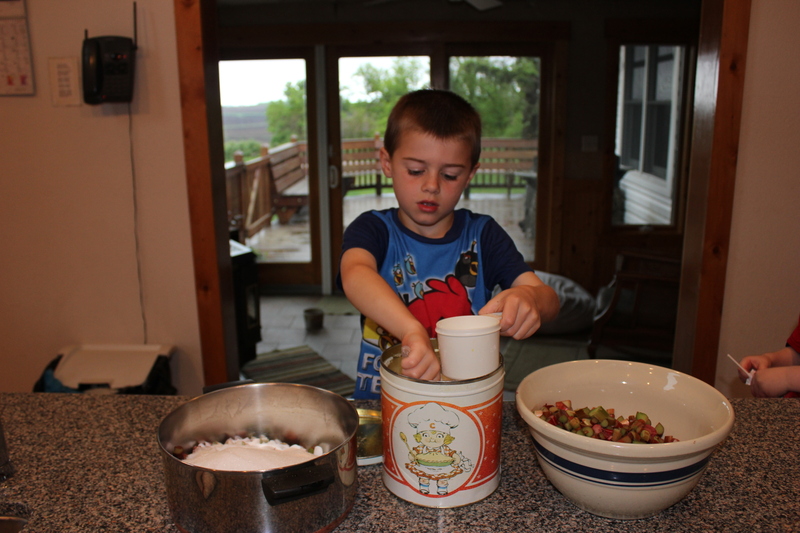 Get them involved in cooking now, it is a skill that will last a lifetime. First wash the rhubarb, cut off both ends and cut out any damaged parts of the stalk. Next cut it into 1/4 inch – 1/2 inch pieces. Cut together using a fork or a pastry knife. Pat into 9×13 pan. Top with rhubarb. 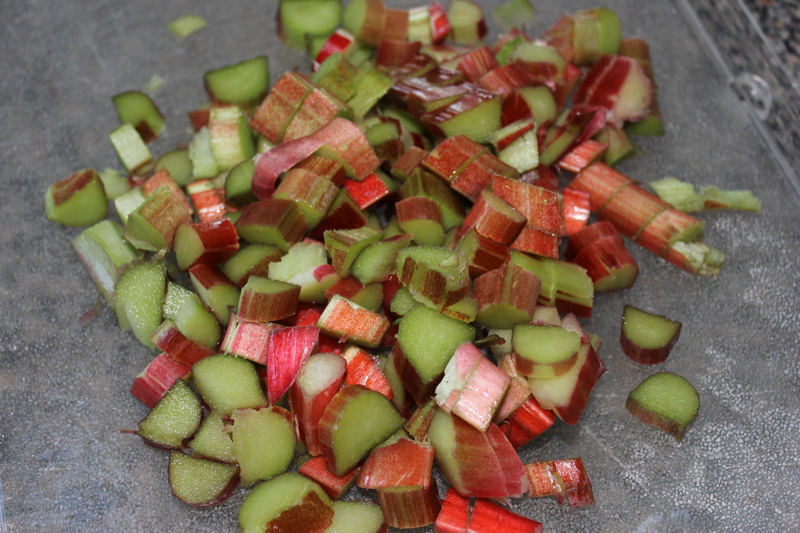 6 cups rhubarb cut into 1/2 inch pieces – Put rhubarb over crust. 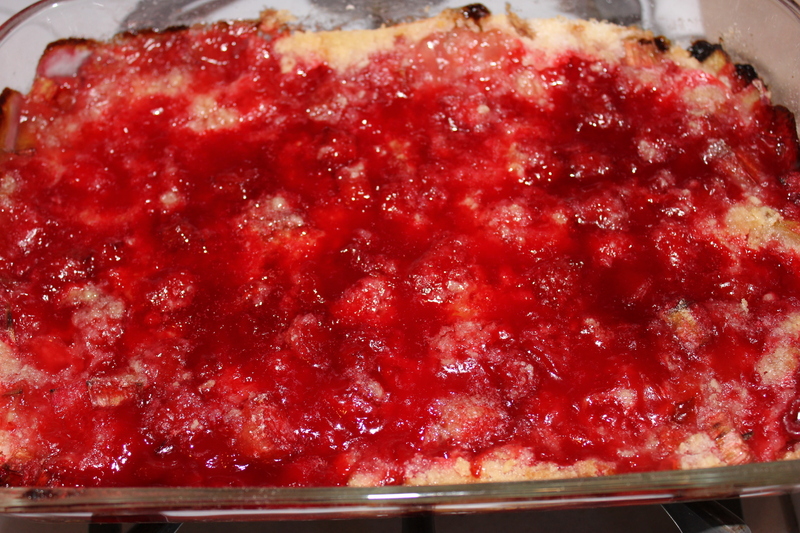 6 oz package strawberry or raspberry Jello – sprinkle over rhubarb. Mix and put on top of Jello. Bake at 375 degrees Fahrenheit for 45 minutes. 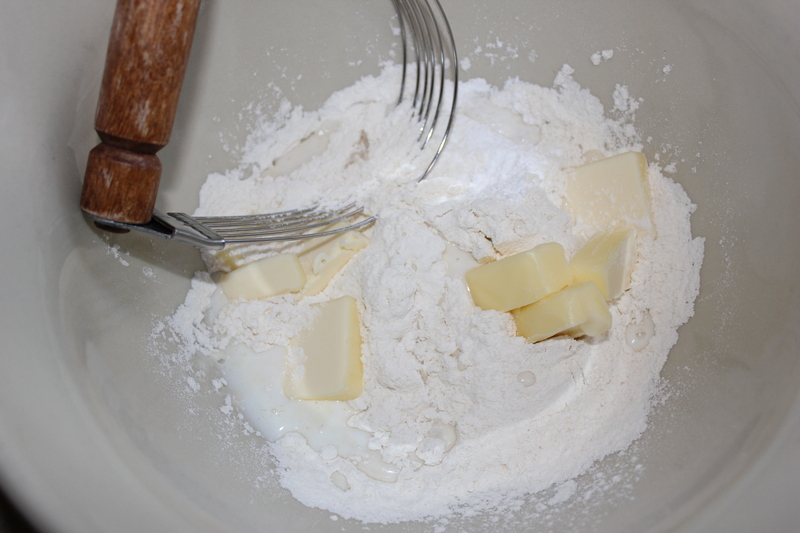 Gently spread topping over other ingredients. Enjoy! Delicious right out of the oven with some ice cream. A great way to enjoy this spring crop and celebrate June Dairy Month. Cut together using a fork or a pastry knife. Pat into 9×13 pan. Mix and put on top of Jello. Bake at 375 degrees Fahrenheit for 45 minutes. Enjoy! 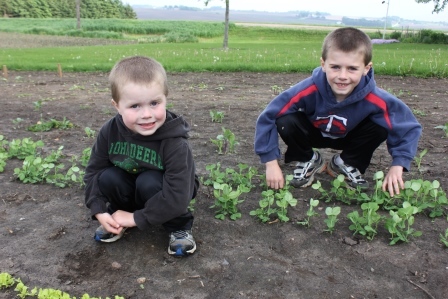 Look what is growing…sugar snap peas. A lot of germination took place in the garden this past week. 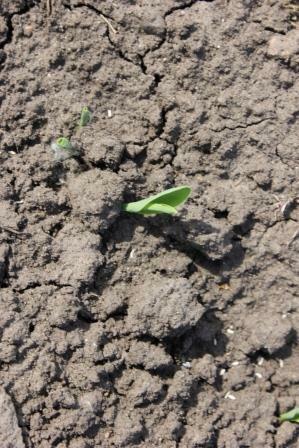 But the lack of warm weather is really challenging plant growth and plant health. We are sure hoping that the weather forecast next week is correct with normal to warmer temperatures. While our boxes weren’t quite as full as we had hoped, the great news is that delivery has started, and as the season progresses, you will continue to see your culinary options grow. The garden planting schedule and growth have been challenging and slow due to the cold spring, and the plants are not getting the necessary growing degree days to reach maturity. On the upside our drought has subsided, and this is a blessing. Check out this interactive drought monitor map to see how the drought has changed over the last few months. We are excited to see the daily changes and growth in the garden. Look for weekly blog posts for guidance through the season. 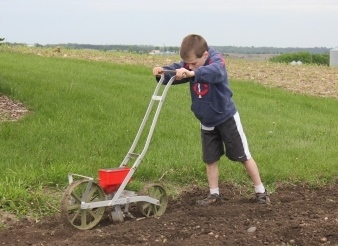 Sam helped Steve re-till part of the garden to finish planting some broom corn as well as another planting of sugar snap peas and green beans. 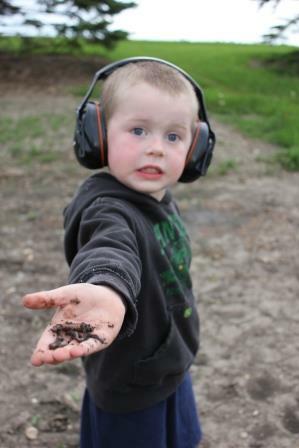 But what is Sam’s end goal when we are in the garden…finding worms for his worm farm. 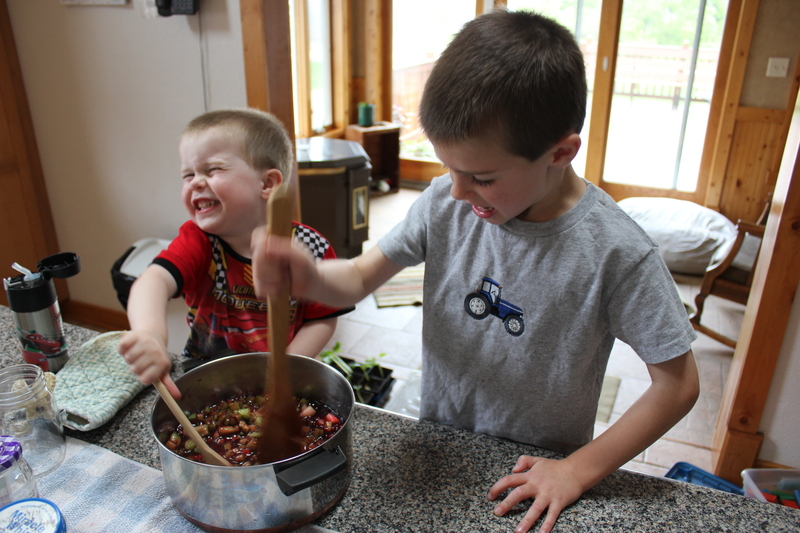 Rhubarb – one pound equals about 3 cups. Wash, cut the ends off, cut off any bad parts damaged by wind or hail, chop into 1/4 – 1/2 inch pieces. You can freeze it in a Ziploc bag (no blanching) and use for months to come. Our family loves it in muffins, breads, jam, pie, crisp, sauce and torte. 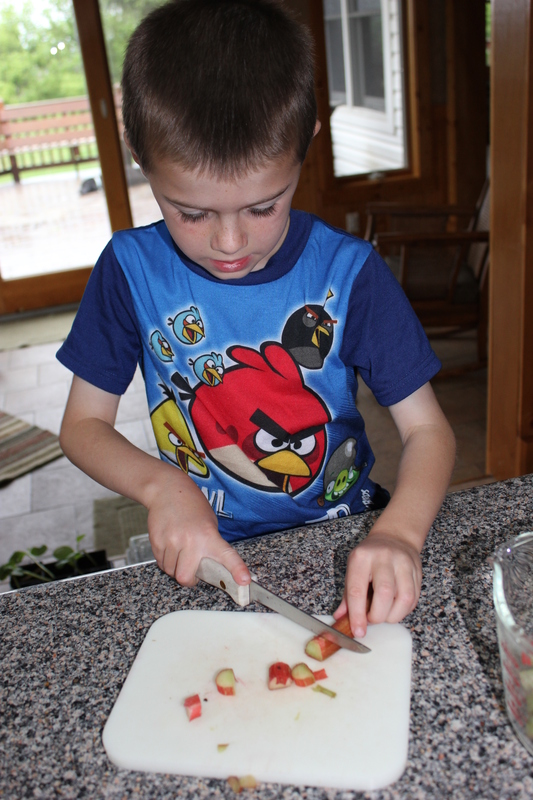 Check out earlier posts on rhubarb for recipe ideas. Asparagus – wash and run a knife gently over the darker arrow pieces on the stem. Cut into 1 inch pieces and place in microwave for a few minutes. Follow your microwave directions. 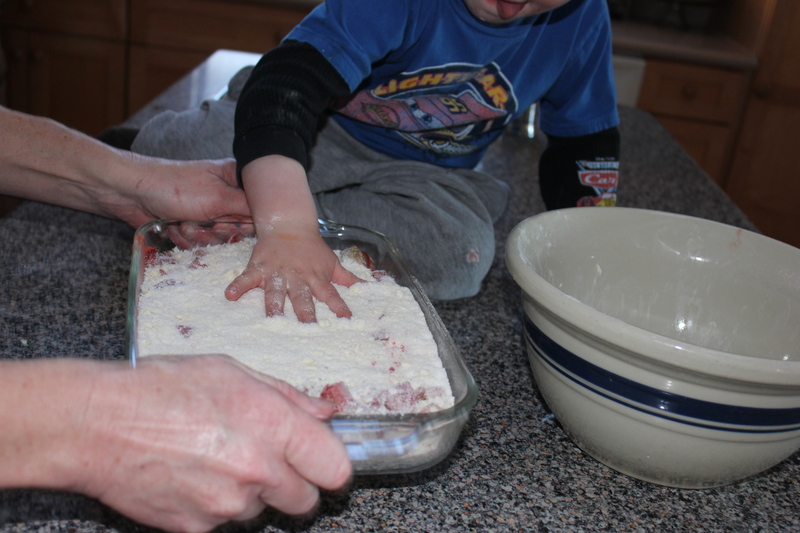 Sprinkle with some parmesan cheese – the boys absolutely love it this way! Herbs – chives, lemon thyme, golden oregano and thyme (bags are labeled with the first initial) wash then chop up chives into small pieces. Fresh cut arrangement – Hosta leaves…these last forever in a vase of water. After a week, give them a fresh cut, and they will last longer. The greenery in the house is a day brightener. Keith planted the peas. We are hopeful this will improve soil health in this area of the garden. Peas are a legume which is a plant that has nodules on its roots which naturally put nitrogen back into the soil. Other plants that are also legumes include alfalfa and soybeans. Keith helped plant the vines in our mulch this week. This included transplanting plants we started earlier this spring, as well as, starting some by seed. 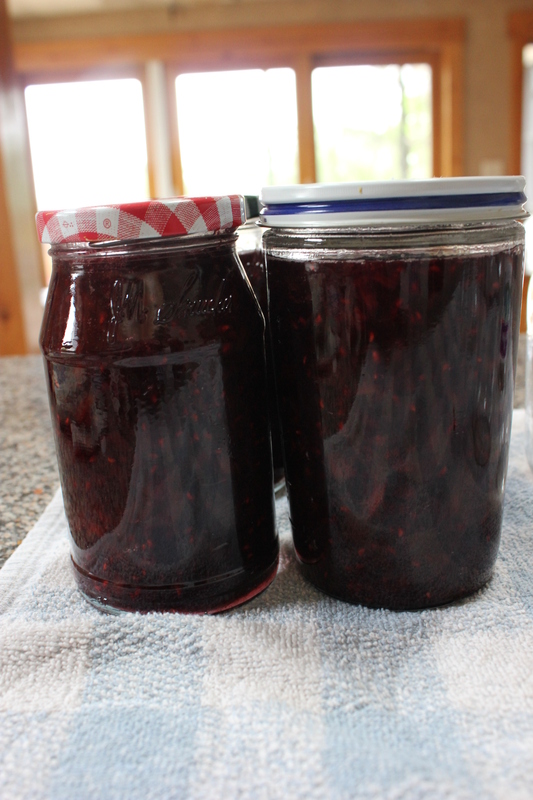 Our family loves this recipe – this is the jam in our refrigerator. I make a variety (blueberry, cherry, strawberry, raspberry) and place in the freezer. When we need another jar of jam, I simply thaw it out in the refrigerator. 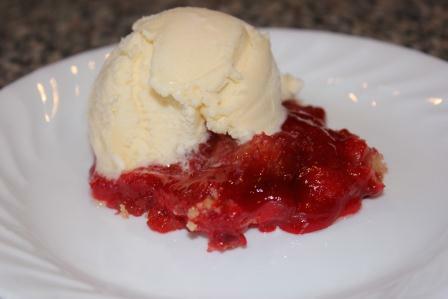 If we are running low on our supply of jam, I go to the freezer and take out some rhubarb that I have already chopped up and frozen in a Ziploc bag, premeasured with the bag labeled 6 cups rhubarb and stock up on our supply. Cook these ingredients for 20 minutes. 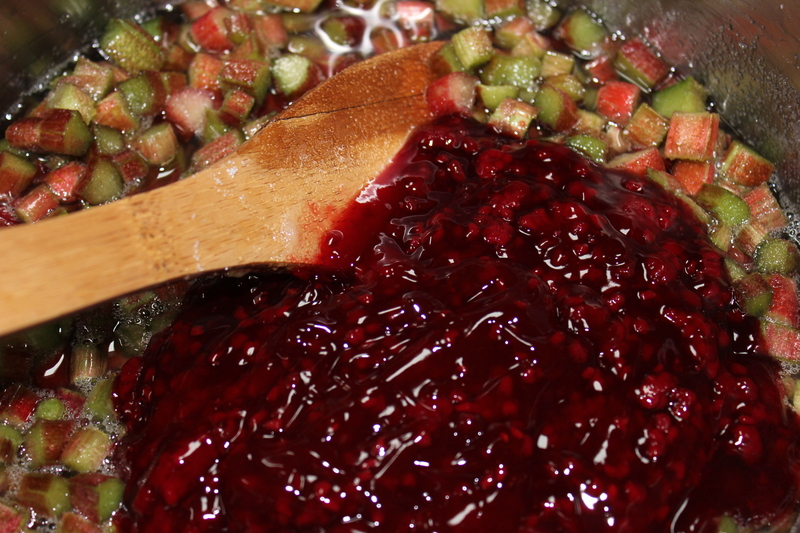 Remove from heat and add 1 package of 3 ounce Jello (use Jello that is of the same flavor as the pie filling). Mix well. Pour into containers. Refrigerate or freeze. 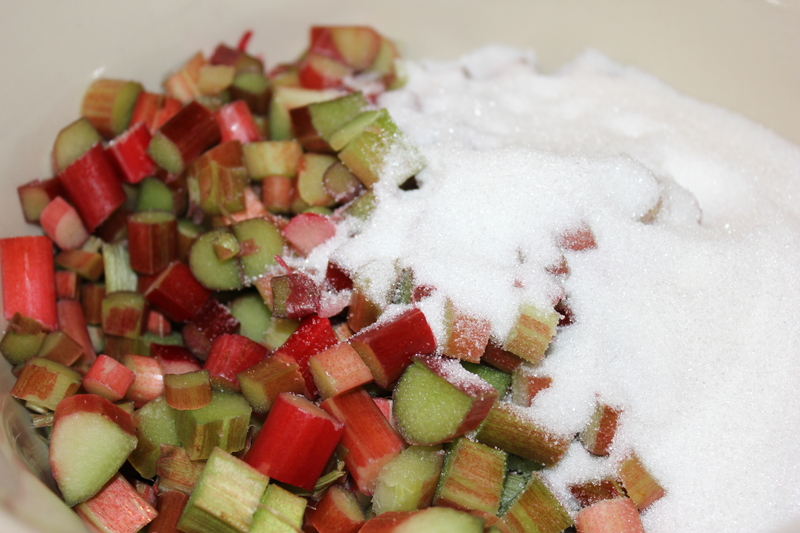 Wash you rhubarb under cold running water. Cut off each end and cut out any bad spots. Cut it into 1/4 inch pieces. 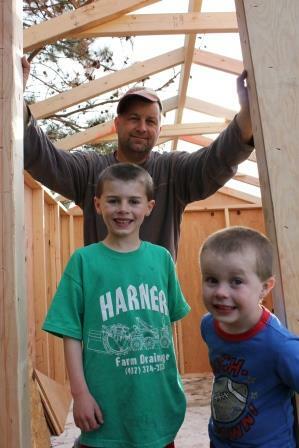 I believe in engaging the kids in the process and teaching them safety along the way. Everything does take a tad longer now but should empower them to do more in the end. 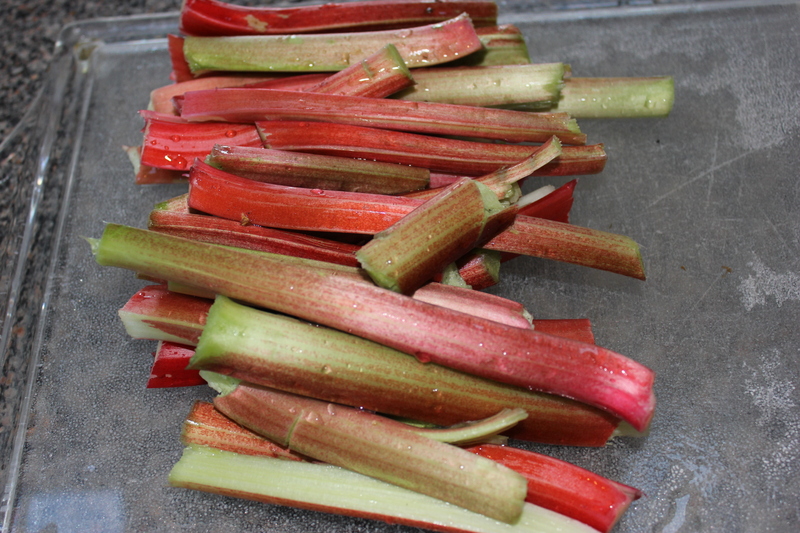 A view of what the rhubarb will look like after cutting it up. Measure out your sugar. Take a knife and run it over the top of your measuring cup. Did you know that Minnesota is the number one producer of sugarbeets in the nation? Sugarbeets are used to make granular, powder and brown sugars and molasses. Check out sugarbeet harvest in Minnesota’s Red River Valley. So proud to be able to work with the featured farmer! 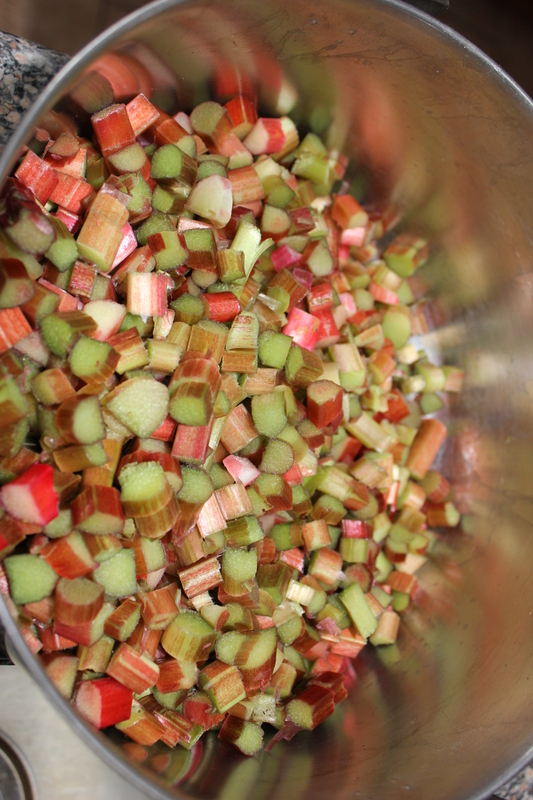 Mix together 6 cups of sliced rhubarb with 3 cups of sugar. 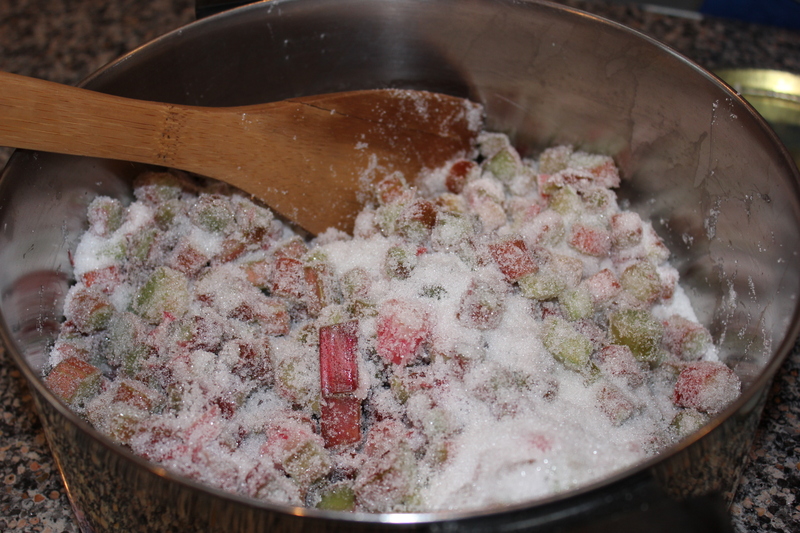 Mix in the sugar, coating the rhubarb. 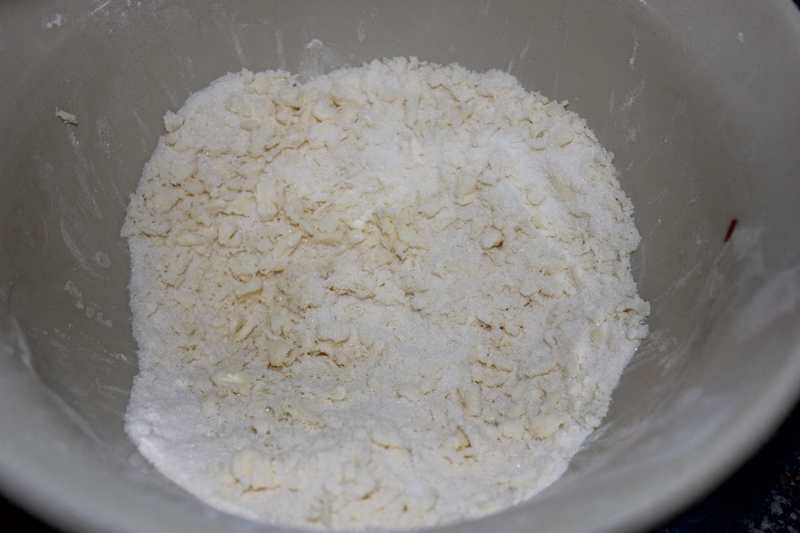 Let it sit until it makes its own juice and most of the granular sugar has changed into sugar juice. This takes about an hour or so. I go back and mix it every so often. 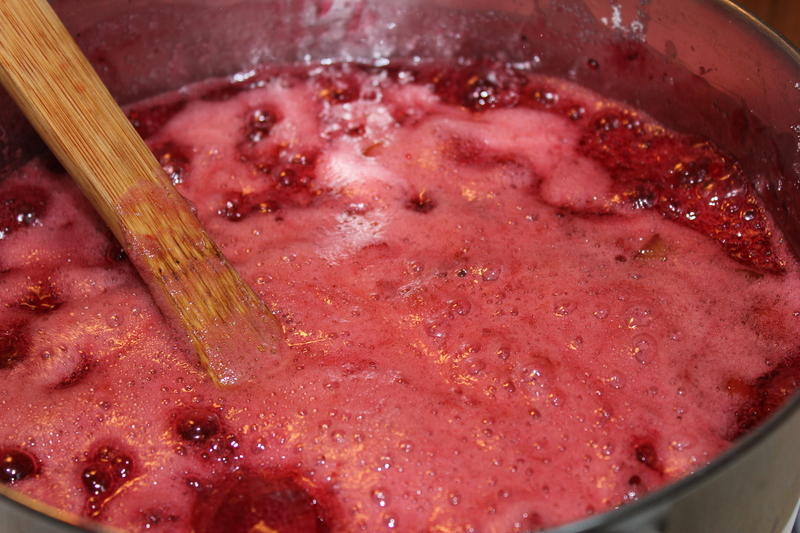 Once the juice has formed, place on the stove over medium heat and add 1 can of cherry, blueberry, raspberry or strawberry pie filling. Cook for 20 minutes. The rhubarb will begin a gentle boil. Turn the heat down so it is not in a rapid boil but rather a simmering boil. Take off the stove and stir in 1 (3 oz) package of Jello. So for raspberry pie filling, I use raspberry Jello. Stir until dissolved. I have not noticed a difference in the end result if I use the regular or the sugar free. Both turn out delicious. 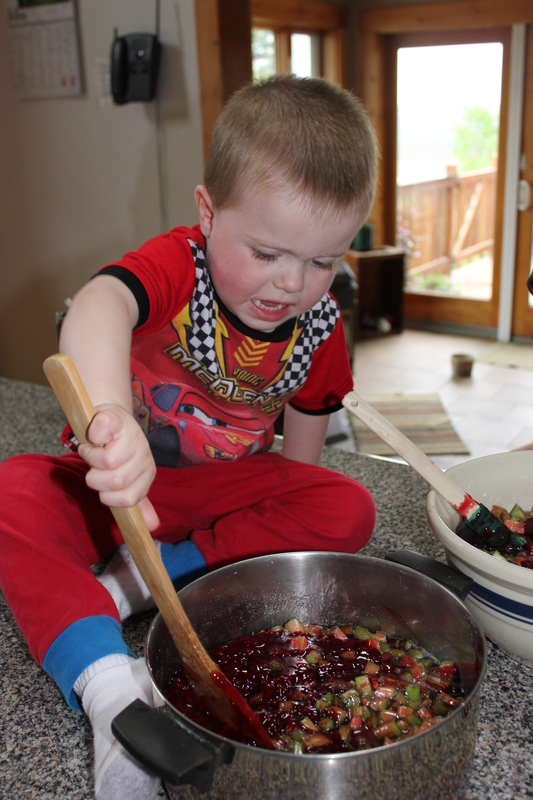 The boys are both great help in the kitchen. 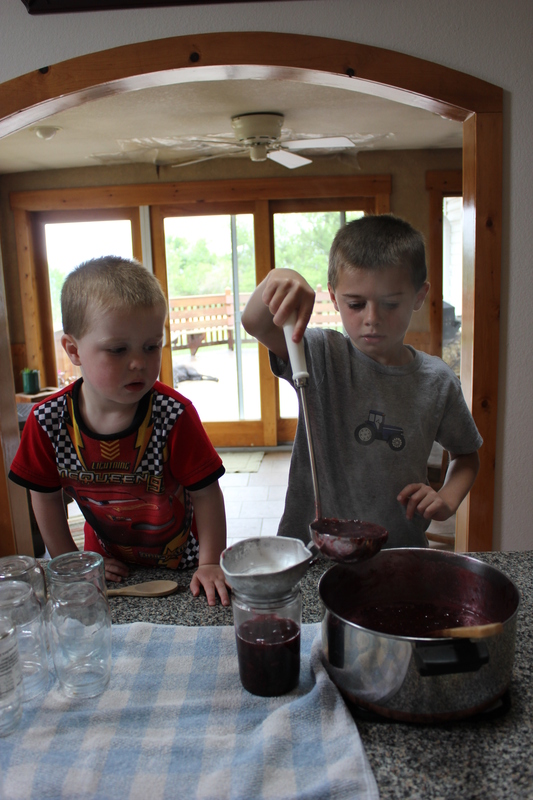 Here they are gently stirring in a 3 oz package of Jello until dissolved. 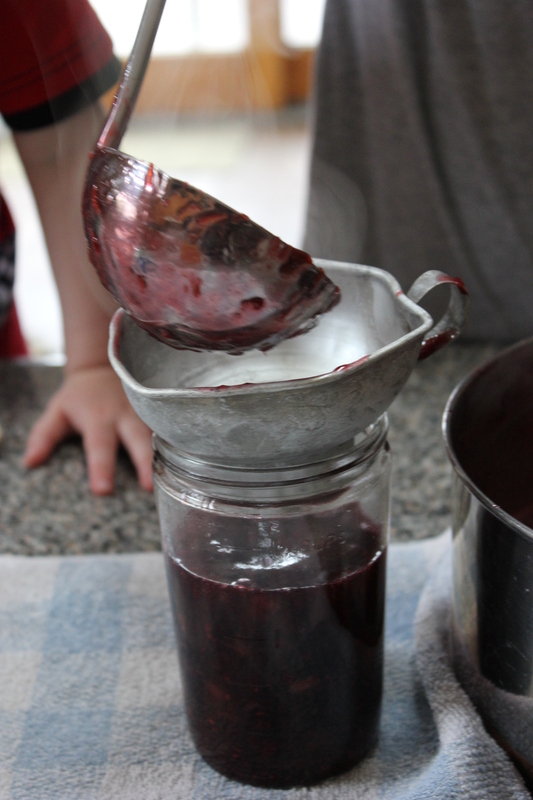 Using a ladle and a canning funnel, gently pour the hot mixture into your jars. We are grateful that we received Steve’s Grandpa and Grandma Gifford’s canning and gardening gadgets and tools. They make these projects easier and more fun. What boy doesn’t love an interesting gadget. In this photo, you guessed it – the gadget from the Gifford’s was the funnel. After the jar is full, use a clean wet wash cloth and wipe off the top of the jar and wipe off any spills on the jar. Tighten up the lid and label your jar. Place in refrigerator to cool the jam down. Place in freezer after a day or two days. Enjoy!